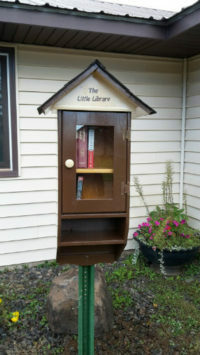 Weekenders Carole and Ron Hessler built this adorable Little Library for Cloverton. People can leave a book, then take a book to read. Meeting called to order to order at 7:30pm by Chair Dave Fornengo. Also present were Supervisors Beverly Carlin and Jason Fornengo, Treasurer Mandy Fornengo, Clerk Fran Levings, and Tamara Miritello. Motion by Jason Fornengo, second by Beverly Carlin, to approve the Agenda. Carried. Motion by Jason Fornengo, second by Dave Fornengo, to approve the Minutes of February 13, 2019. Carried. Treasurer Mandy Fornengo presented the Treasurer’s Report. Motion by Dave Fornengo, second by Beverly Carlin, to approve the Treasurer’s Report. Carried. Clerk Fran Levings presented the Claims List & the Net Payroll List for approval. Motion by Jason Fornengo, second by Dave Fornengo, to pay these bills. Carried . Thank you to Beverly Carlin for serving as Supervisor for 8 months. NPAHD Report- Levings reported that the Hospital District Newsletter delineated all of the activities for the past few months. She said that the District is now reimbursing for mileage for board members. Township received a request from a property owner to sell him some land that we had purchased a few years ago. Chair Fornengo will research this. Township received notification of 4 tax-forfeited properties that will be put on auction by Pine County. Township has first option to purchase. Meeting adjourned at 8:10 pm. The Board of Appeal and Equalization of New Dosey Township will meet on April 8, 2019, 11am at the Cloverton Town Hall. The purpose of this meeting will be to determine whether property in the jurisdiction has been properly valued and classified by the assessor. If you believe the value of your property is incorrect, you may appear before this Board. The Board will review your assessments and may make corrections as needed. The Board of Appeal and Equalization meeting of the New Dosey Town Board will meet on April 9, 2018. at 11 am at the Cloverton Town Hall. The purpose of this meeting is to determine whether property in the township has been properly valued and classified by the assessor. Entries (RSS) and Comments (RSS).- This is the official web site of the New Dosey Township, Minnesota. The Township has made every effort to ensure the accuracy of the information provided. However, due to the possibility of unauthorized access to this site, data transmission error, or changes to source material, the information contained on this web site should not be deemed reliable for legal purposes. Contact the Town Clerk to verify the accuracy of the data.